At Oakland Music Complex, the Bay Area's largest practice space, the waiting list boasts more than 150 names. But hip-hop might be out of bounds. George Anderson manages the in-demand Oakland Music Complex. Oakland Music Complex, the largest rehearsal space in the Bay Area, is a hulking, unmarked building bounded by train tracks, a utilities center, and newfangled businesses on the edge of a residential neighborhood in West Oakland. A rollup door reveals a loading dock that leads to a freight elevator. Day and night, musicians enter with keycards. The second and third floors are labyrinthine and loud, treating visitors to telltale odors and an echoing mishmash of idle noodling and concert-volume discord. OMC is also a subcultural junction: tousled budget-rockers share windowless rooms with the norm-core rank and file, while neatnik metal-heads vie against spikey punks for pushcarts come gig night, all of them at least exchanging nods in the concrete hallways. As many as five or six groups share some of the units, which range in cost from $600 to $1,000 per month. And there is no vacancy. In 2009, when a contentious management switch changed the name from Soundwave Studios to OMC, more than half of the 150 rooms were empty. Today, according to the management, the waiting list boasts more than 150 names. Demand for rehearsal space in Oakland isn't unique to OMC; every monthly rental complex surveyed for this article is full. Ronn Simpson, who operates the Temescal practice known as JJ's, said he doesn't bother with a waiting list — so rare are new openings. Dave Tisser, who's run the 18-unit M&M Studios in Fruitvale since 1990, said he turns down one rental inquiry a week. "The demand's there," said Chuck Stilphen, who manages OMC and a smaller East Oakland studio under the umbrella business Rehearse America. "I'm surprised myself." Is it surprising? On one hand, technology has rendered music-making increasingly compact, enabling at-home "in the box" production; a generation of artists weaned on GarageBand, especially those working in hip-hop and electronic music, forgo the cost of remote studios. On the other hand, houses and repurposed commercial spaces that once hosted practices and gigs are fewer, forcing bands out of basements. Plus, the influx of young, wealthy tech workers has proven a boon to recording as well as rehearsal studios. But OMC's emergence as a bustling hub for punk, metal, and indie rock, with its relative lack of hip-hop production and recording studios, is also in part by design: In 2009, while transitioning from Soundwave to OMC, on-site manager George Anderson said he instituted a rule banning tenants from seeing clientele. The policy followed concerns about safety specifically regarding recording and production studios — which are most conventional in hip-hop. But the policy is selectively enforced. Anderson said it doesn't apply to tenants who teach out of their units, and there are still plenty of people who use their rooms to record bands. In other words, OMC's policy looks like a proxy for anxieties about hip-hop, a familiar source of tension in the music industry. Alan Lucchesi started Soundwave in 2002 as a monthly rental complement to his same-named hourly studio across the street, with the financial backing of the property owner, real-estate mogul Peter Sullivan. 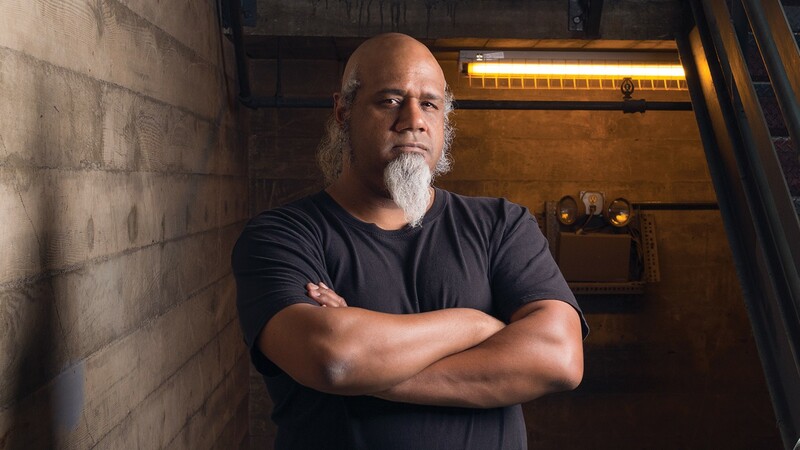 By then, Lucchesi was legendary in the rehearsal business, having rented to artists including Too $hort, Faith No More, and Tupac Shakur (whose 2Pacalypse Now release show occurred at his Jackson Street Studios). A 2009 Express profile stressed his ease with rappers and rockers alike, describing him as a "folk hero" with a permissive attitude toward his tenants' partying and sidelines. Soundwave, under Lucchesi's leadership, housed every aspect of the hip-hop business: producer Tavahn Ghazi, owner of the Little Shamrock bar in San Francisco and a producer with Text Me Records, ran his publishing company on site. Prashant Kumar, a prominent artist manager, recalled visiting with clients such as The Jacka to record. Lucchesi rented three rooms to legendary Vallejo rapper Mac Dre; the Express profile even floats a claim that "the building" in "Feelin' Myself" refers to Soundwave. The article also spotlights the space's non-musical activities, saying Lucchesi "logged two dead bodies and two confirmed conceptions at Soundwave." Eventually, a rift emerged between Lucchesi, who didn't respond to interview requests, and Sullivan, who installed new management in 2009, rebranding the business Oakland Music Complex. "[Lucchesi] stepped back," said Stilphen. But a since-deleted post on Soundwave's website stated, "The people who own the building hijacked the business." The recession hit rehearsal studios hard; every longtime operator interviewed for this article described it as a time of widespread vacancies. But Anderson, OMC's on-site manager, said Soundwave had so many empty units in 2009 because the space had a "bad reputation." "Soundwave was a dangerous place, lots of criminal and thugs," he said. "We didn't know who was here. People with street names, how do you deal with that?" Several musicians who've practiced at the building in both incarnations said that, before, there seemed to be more action in the hallways, but no one described it as dangerous. Some mentioned people living in the units, but that still happens. One recalled getting away with throwing a gig in his practice space. In the transition, did he Anderson have to ask many people to leave? "The answer is yes," he said, after some hesitation. "But it was because they were behind on rent." At any rate, the ensuing, selectively enforced policy banning clientele, along with the ousting of Lucchesi, effectively outlawed the sort of production and recording studios that hip-hop figures such as Mac Dre used as hangouts and workplaces. Anderson, who plays in a band called From Hell, said that the OMC re-launch attracted more punk and metal bands ("They tended to be braver," he reckoned). He started requiring identification for keycards and closely policing use of the space. "Occasionally people try to live here, because it's 24/7," he said. "They're always unhappy to get a three-day eviction notice." Editor's Note: A prior version of this article misidentified Tavahn Ghazi as the founder of Empire, the record label. In fact, he owns Little Shamrock.